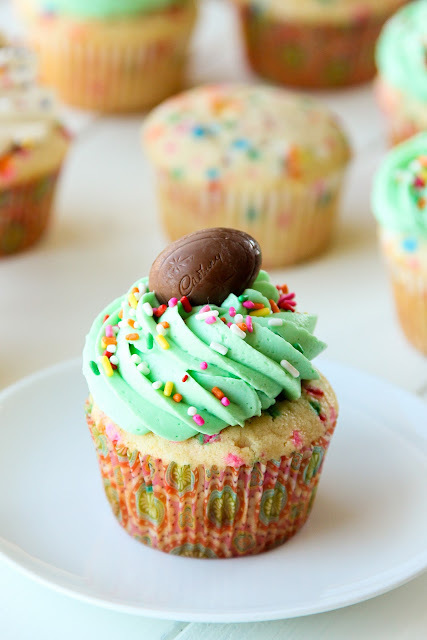 Funfetti Cupcakes - Hi, friend Popular Recipes, in this article entitled Funfetti Cupcakes, we have prepared this article well and concise to be easy to understand for you to read and can be taken inside information. hopefully the contents of the post Article baking, Article cake, Article cupcakes, Article food, Article mini, Article recipe, that we write this you can understand and useful. okay, happy reading. Looking for a last minute Easter treat? Well you're in the right place! This afternoon I decided to whip up a batch of homemade funfetti cupcakes- my favorite! I don't make them very often (mainly because of the amount of sprinkles that go into them), but when I do, I really enjoy them! As soon as they came out of the oven I couldn't help but taste test a mini one. They were perfectly moist and tender inside. I decided to frost mine with a vanilla buttercream and colored it green for a "grassy" look. Because I had some extra mini Cadbury creme eggs laying around I pressed a few into the frosting to finish them off. I think Starburst jelly beans would be really cute too or even a chocolate bunny! Enjoy and Happy Easter!!! 1. Preheat oven to 350 degrees. Line two standard cupcake pans (or three minis) with liners, set aside. 2. In the bowl of a stand mixer, beat butter and sugars until light and fluffy, about 3 minutes. Add vanilla bean paste and almond extract. With mixing speed on low, add egg, then egg yolk, mixing until just combined. 4. Remove bowl from stand and gently fold in sprinkles. Scoop batter into the cupcake liners, filling each ⅔ of the way full. Place in the oven and bake for 18-22 minutes (8-12 for minis) or until the cupcakes spring back when touched and are slightly golden brown on top. 5. Remove from oven and allow to cool in pans for 5 minutes before removing and transferring to a wire rack to cool completely (about 25 minutes). 6. While cupcakes are cooling, in the bowl of a stand mixer fitted with the whisk attachment, combine butter, salt, and vanilla. Beat until fluffy (2-3 minutes). With mixing speed on low, add heavy cream, then gradually add ½ c. powdered sugar at a time until the mixture becomes soft but firm enough to hold it's shape. Add food coloring (as little or as much as you want until it reaches a shade you like, I went for more of a pastel), beat frosting for an additional 3 minutes until light and fluffy. Pipe on cooled cupcakes as desired. Garnish with festive candies or sprinkles. Thank You and Good article Funfetti Cupcakes this time, hopefully can benefit for you all. see you in other article postings.